Groups in the Active Directory domain are synchronized if it is configured in the sync agreement by selecting the Sync New Windows Groups option. All of the Windows groups are copied to the Directory Server when synchronization is initiated and then new groups are synchronized over as they are created. A Directory Server group account is synchronized to Active Directory through specific attributes that are present on the Directory Server entry. Any Directory Server entry must have the ntGroup object class and the ntGroupCreateNewGroup attribute; the ntGroupCreateNewGroup attribute (even on an existing entry) signals Directory Server Windows Synchronization to write the entry over to the Active Directory server. New or modified groups that have the ntGroup object class are created and synchronized over to the Windows machine at the next regular update. When a group is synchronized, the list of all of its members is also synchronized. However, the member entries themselves are not synchronized unless user sync is enabled and applies to those entries. This could create a problem when an application or service tries to do a modify operation on all members in a group on the Active Directory server, if some of those users do not exist. Two attributes control whether Directory Server groups are created and deleted on Active Directory, ntGroupCreateNewGroup and ntGroupDeleteGroup. ntGroupCreateNewGroup is required to sync Directory Server groups over to Active Directory. ntUserDomainId contains the unique ID for the entry on the Active Directory domain. This is the only required attribute for the ntGroup object class. ntGroupType is the type of Windows group. Windows group types are global/security, domain local/security, builtin, universal/security, global/distribution, domain local/distribution, or universal/distribution. This is set automatically for Windows groups that are synchronized over, but this attribute must be set manually on Directory Server entries before they can be synchronized. Some attributes used in Directory Server and Active Directory group entries are identical. These are usually attributes defined in an LDAP standard, which are common among all LDAP services. These attributes are synchronized to one another exactly. Table 16.4, “Group Entry Attributes That Are the Same between Directory Server and Active Directory” shows attributes that are the same between the Directory Server and Windows servers. Some attributes define the same information, but the names of the attributes or their schema definitions are different. These attributes are mapped between Active Directory and Directory Server, so that attribute A in one server is treated as attribute B in the other. For synchronization, many of these attributes relate to Windows-specific information. Table 16.3, “Group Entry Attribute Mapping between Directory Server and Active Directory” shows the attributes that are mapped between the Directory Server and Windows servers. For more information on the differences in ways that Directory Server and Active Directory handle some schema elements, see Section 16.6.3, “Group Schema Differences between Red Hat Directory Server and Active Directory”. [a] The Member attribute in Active Directory is synchronized to the uniqueMember attribute in Directory Server. Nested groups (where a group contains another group as a member) are supported and for Windows Synchronization are synchronized. However, Active Directory imposes certain constraints as to the composition of nested groups. For example, a global group is not allowed to contain a domain local group as a member. Directory Server has no concept of local and global groups, and, therefore, it is possible to create entries on the Directory Server side that violate Active Directory's constraints when synchronized. For Directory Server groups to be synchronized over to Active Directory, the group entries must have the appropriate sync attributes set. Right-click the group entry, and click Advanced to open the advanced property editor for the entry. All of the sync-related attributes must be added manually, so only the advanced property editor can set the attributes. Click the objectClasses field, and then click the Add Value button. Select the ntGroup object class. 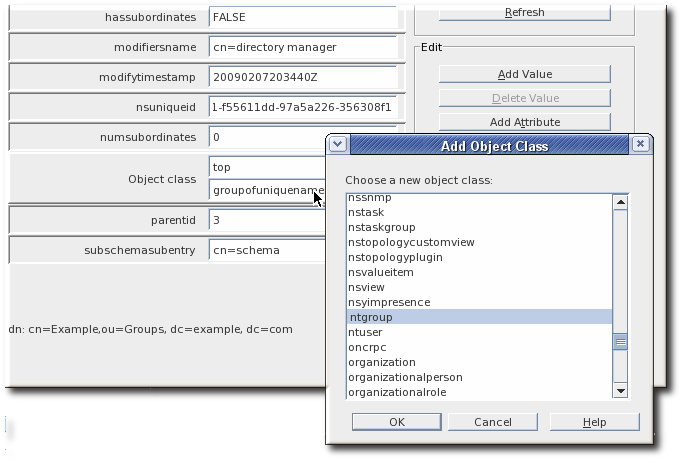 Setting the ntGroup object class automatically adds the ntUserDomainId attribute. This attribute is required, so add a value. To enable synchronization, click the Add Attribute button, and select the ntGroupCreateNewGroup attribute from the list. Then, set its value to true. 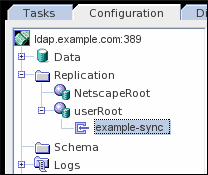 This signals to the sync plug-in that the entry should be added to the Active Directory directory. To delete the group entry from the Active Directory domain if it is deleted from the Directory Server database, set the ntGroupDeleteGroup attribute and set it to true. Add any other Windows attributes for the Directory Server entry. The available attributes are listed in Section 16.6.2, “Group Attributes Synchronized between Directory Server and Active Directory”. If the ntGroupType is not added, then the group is automatically added as a global security group (ntGroupType:-2147483646). The ntUserDomainId attribute, to give the Windows ID for the entry. The ntGroupCreateNewGroup attribute, to signal to the synchronization plug-in to sync the Directory Server entry over to Active Directory. The ntGroupDeleteGroup attribute is optional, but this sets whether to delete the entry automatically from the Active Directory domain if it is deleted in the Directory Server. It is also recommended to add the ntGroupType attribute. If this attribute is not specified, then the group is automatically added as a global security group (ntGroupType:-2147483646). Many additional Windows and group attributes can be added to the entry. All of the schema which is synchronized is listed in Section 16.6.2, “Group Attributes Synchronized between Directory Server and Active Directory”. Windows-specific attributes, belonging to the ntGroup object class, are described in more detail in the Red Hat Directory Server 10 Configuration, Command, and File Reference. Check the New Windows Group Sync check box to enable group sync. To disable sync, uncheck the box. For new sync agreements, select the corresponding group sync check box in the sync agreement creation wizard. To disable group sync, set nsds7NewWinGroupSyncEnabled: off.